Make these delicious, moist and best choc cup cakes EVER! 1. Preheat oven to 180 degrees C (375 F). 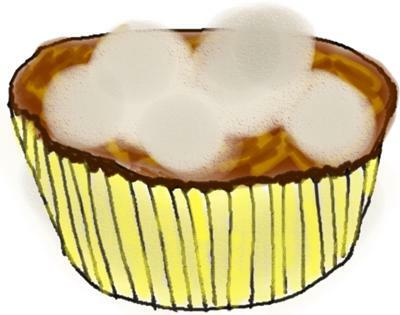 3. in a bowl with an electric mixer, mix together the sugar, flour, cocoa powder, baking powder, bicarb soda and salt. 4. Add the eggs milk oil and vanilla essence and beat for 2 minutes on medium speed. Then stir the boiling water in. The mixture should be runny. 5. Pour the batter into the paper cups equally. Bake for about 10-12 minutes. 6. Let them cool completely before you ice them. 1. With an electric mixer beat together the butter and cocoa powder. Adding a little of each at a time, add icing sugar and milk, beating on medium speed until it reaches spreading consistency. Stir in more milk if required. then add the vanilla essence. 2. Chop the Flake bars and put on top in a circle to look like a nest on each cup cake. In the middle place some small white chocolate Easter eggs.